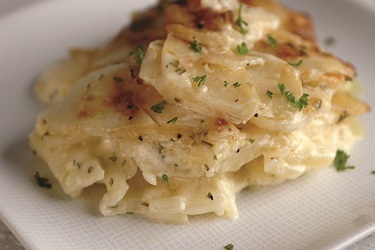 Scalloped Potatoes are thinly sliced potatoes cooked in layers with some form of cream sauce. Other ingredients are frequently added for new flavors or even to make an entire meal out of the dish. Some common ingredients added are cheese and ham. 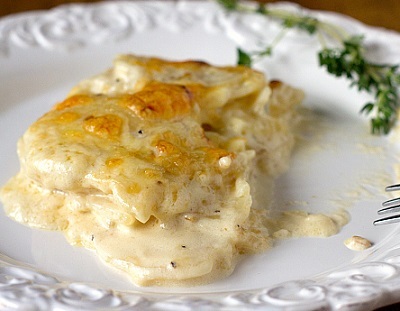 Many years ago the word "scalloped" referred to seafood creamed and served in the shell. Today this dish does not have any seafood. This potato recipe is frequently considered a holiday dish but I have found these potatoes very "saleable" at the restaurant anytime I feature them on the special sheet. 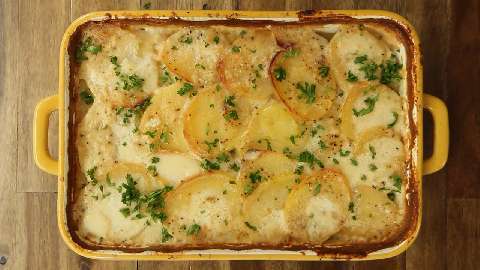 To cook these potatoes you layer thinly sliced potatoes with milk or cream and, if you want, onions and parsley and bake them. The potatoes absorb the liquid as they cook. One important pointer - use a shallow casserole dish. You don't want crispy on top (which I like) but then having the potatoes not cooked enough inside. Another tip, if you need a faster cooking time, par-boil the potatoes first for a few minutes. Enjoy this easy recipe for potatoes and the company of those you share it with!